Here's another book to add to your list to read before the film comes out. The Wachowskis have been hard at work on their latest endeavor, CLOUD ATLAS, which is based on the best selling 2004 novel. Makes total sense right? Don't worry, the new trailer clears everything up for you. I'm still a little lost, though. At least from the trailer, I'm getting a BABEL and THE FOUNTAIN. I dig the whole idea of the story lines interweaving, and I'm hoping The Wachowskis have created something unique and coherent. It's an epic cast, and I'm keeping my hopes up that the film will be just as epic and not end up in a cluster. 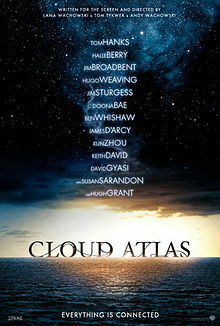 CLOUD ATLAS will be released October 26, 2012 starring Tom Hanks, Halle Berry, Jim Broadbent, Hugo Weaving and Jim Sturgess.